It's been far too long, but The Incredibles 2 is finally coming to theaters next year. Details on the sequel have been very mysterious, as writer and director Brad Bird, who returns for the sequel, has been playing things very close to the chest. Now, a newly revealed image from the movie shows us that Bob Iger wasn't kidding over the summer when he said this movie picks up right where the first movie ended. Here's what Brad Bird had to say about it in a new interview. "Incredibles 2 picks up, literally, where the first film left off, with Mr. Incredible and Elastigirl battling The Underminer, while Violet and Dash are stuck with babysitting Jack-Jack. That's all we're saying for now. but rest assured, there are a lot more superheroics in store for our 'family dynamic.'" Even though The Incredibles 2 picks up right where the first movie ended, the dynamic has shifted completely. This time around, Mrs. Incredible is taking the lead when it comes to adventure and heroics. Holly Hunter returns to reprise her role as the head of Pixar's super-family and she says that this time, Mrs. Incredible, aka Elastigirl, is tackling her own ambition instead of being forced out of retirement. "Helen's appetite for adventure comes to the fore. Whereas before, she was driven to become Mrs. Incredible out of necessity, where she went into it to save her husband, I think this time she really meets her own ambition head-on. The ambition of being an adventure is something that we get to explore." Brad Bird had a rare misstep with his last live-action movie, Tomorrowland. Save for that, his track-record is near spotless. Especially when it comes to animation. Holly Hunter is not shy about heaping praise onto the director and hypes up Incredibles 2 a lot. "It's always interesting when you have a storyteller who can take off the way that Brad can, and in a way, I feel that his storytelling abilities acquired a different kind of lift-off with this movie. This time was so much fun because I know Brad so much better, and the way the story unfolded for me in the recording sessions has been kind of stratospheric. Brad's imagination veers off into intensely funny stuff, and I find that so fresh. And of course, that also includes the character development of Helen throughout this second movie. It just feels really rich, and like... this guy is a true feminist." Recently, the first trailer for Incredibles 2 was released, which shows the young Jack-Jack exploring his newfound powers, with Mr. Incredible, once again voiced by Craig T. Nelson, rather happy with his son. The trailer broke the record for most views for an animated trailer in 24 hours. So people are hyped to see this movie. 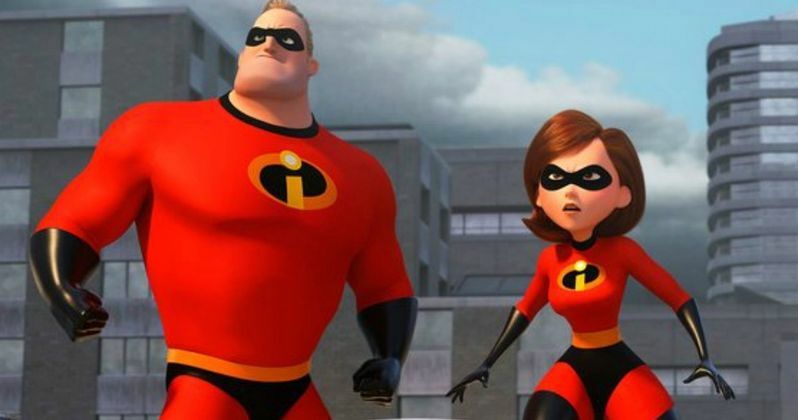 Though The Incredibles deserves a lot of credit for being a great superhero movie, the sequel looks to follow in the footsteps of Wonder Woman and really be a great female-driven superhero movie. "[Helen has] a real incredible sense of competitiveness and ambition. She throws down the gauntlet in this one. It's so much fun to see a woman luxuriating in those two arenas, because women have for so many generations been brought up to not be ambitious or to not be competitive, and it's fun to see Helen basking in those two arenas in much the same way that we give men license to do...It feels like women are reasserting their strength in different ways. I just think it's beautiful that Incredibles 2 is allowing Mrs. Incredible to reveal all these other different colors of who she is." Samuel L. Jackson (Frozone/Lucius) and Sarah Vowell (Violet) also reprise their roles for The Incredibles 2, with Huck Milner stepping in to voice Dash. Disney and Pixar are releasing the highly-anticipated sequel on June 15, 2018. Be sure to check out the first image from The Incredibles 2, courtesy of Entertainment Weekly, for yourself below.